Recent weekend, I took these photos at the Washingtonian Center as the mall celebrated St. Patty's Day a few days early. I think that's because St. Patty's Day falls on a work day. 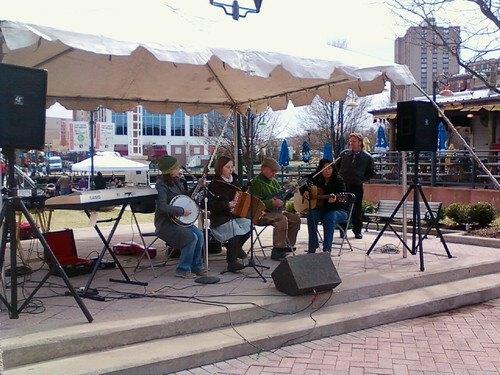 Kepi and I sat at a nearby bench and enjoyed listening to the Irish music of the Kelly Family. Their music is really good and they play extremely well. I was really impressed with that girl playing the Banjo. I thought these clowns were the cutest. They were busy greeting and making everyone smile. Most of my coworkers are wearing green today. I feel odd because I'm the only one dressed in brown and khaki. People kept asking why I wasn't wearing green; it's a shame I forgot (honest). I have so many things in my mind especially that I just had another adventure at the Hematology department. But here's a very green, St. Patty's Day post in the hopes of redeeming myself from forgetting St. Patrick's Day. Wishing everyone a safe and happy St. Patty's Day! Happy St Patrick's Day to you too. Those clowns are so cute. When it's St. Paddy's day, our cafeteria offers corned beef and cabbage and surprisingly it is really good. They do put that on the menu about 4-5 times a year and each time I have to get it. I didn't today, because we have in the slow cooker our very own corned beef and cabbage waiting for us tonight. Tis our 2nd yr in a row we're making that dish. Happy St. Patrick's Day, Kayni? How do you usually celebrate it? It sounds like a festive holiday. @ Angeli, In DC, there are parades, performers of Irish songs/music, sometimes bagpipes, and lots of drinking. It's very festive and to my experience, lots of parties. Cute clown indeed that you've got in there, and not in the usual colors seen in kiddie parties. I remembered my drunk kabayan colleague telling our Irish workmate: " you are famous in playing that instrument, what do you call that, that wish your hands push and pull?" Happy ST Patrick's day. Belated na pala. Bakit wala kang picture sis? Love the clowns' outfits! 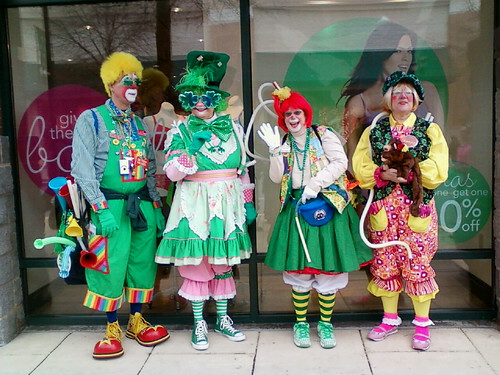 I like the clowns outfit, especially the one with the "star" sunglasses. Hehehe. Cute! the clowns are hilarious. i love their outfits!